What if a child is truly a beginning reader still learning CVC words? Can the game of finding small words within big words or phrases still be used to improve the child’s understanding of words and spelling? Not exactly, but if you limit the letters strategically, a beginning reader can play. Here is how. Instead of writing a big word or phrase such as “New Year’s Day,” write a handful of letters, including only the vowels and consonants which the child has learned. If the child has learned only short a words (cat, ham, fad), write the vowel “A” at the top of the page followed by a handful of letters which you know can be used for form short a CVC words. B, C, D, H, R, and T might be good letters to begin with. You could also use letter tiles (Scrabble letters, for example) so that the child can move letters around. Tactile experience helps young children in learning and makes the learning seem more like a game. Also, the child doesn’t have to hold letter patterns in his head; he can manipulate various letters until he finds a word which then you or he could write down. Demonstrate to the child how mixing up the letters can form words. Write B A T and B A D, showing where you got those letters, and using enough examples so the child knows what to do. The competition aspect of the game might be for the child to “beat” his last score, that is, to find more words than the last time. 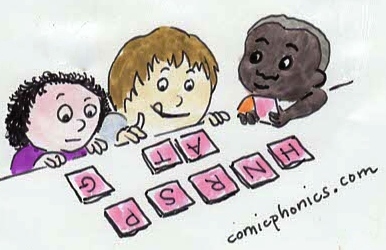 As the child learns more CVC vowels, two vowels can be used with six or seven consonants. I recommend starting with A, then O, and then U. E and I take longer to learn since they sound similar, so I would use them indeptndently (A and E, for example, or O and I) until the child is confident with all CVC words. This is a game which pairs of children can play together as a team, providing one child does not dominate, leaving the other child out. Restricting the number of letter choices can help the child to focus, so do limit the number of vowels and consonants for beginning readers. Once the child is an experienced reader, he can “graduate” to the longer word or phrase game we discussed previously. This entry was posted in CVC words, how to make learning fun, methods of teaching reading, reading readiness., vocabulary. Bookmark the permalink.